PRRD’s SONA 2018 was boring despite the direction of romcom queen Joyce Bernal and compared to the action-drama of the House coup. Even the spectators inside the Batasan were not as excited as before when PRRD’s SONA was interrupted by standing ovations and vigorous clapping. We shed no tears for the hour-long delay in the SONA. The House intramurals expose that the old rotten politics is alive and kicking under PRRD despite his repeated promises of change. Bulok, bulok, bulok sa halip na build, build, build. 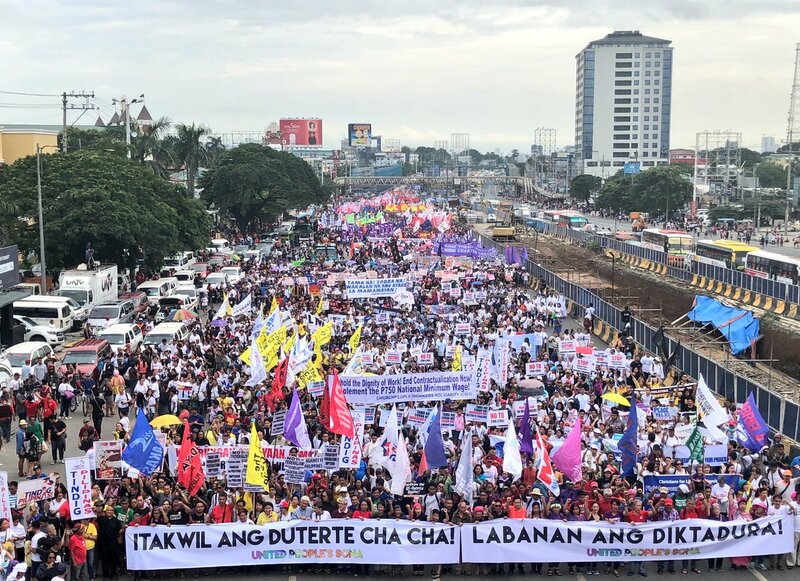 The power play in the House of Representatives, the drop in PRRD’s satisfaction ratings and the massive United People’s SONA rally took the thunder out of the speech. There was nothing new in the SONA 2018. PRRD obviously feels the pressure of the workers’ demand against endo but still refuses to heed the demand to decisively end it. He was less than honest on endo. The 300,000 workers allegedly regularized have either been terminated as companies appeal the DOLE compliance order or have merely been made regular employees of agencies. He had the power to promulgate an executive order that made direct hiring the norm in employment relations but instead he signed a lame EO 51. He asked Congress to a law to end contractualization but he still has not certified the Security of Tenure bill as urgent. PRRD was silent on the workers demand for a wage increase and his promise to end wage regionalization or “provincial rates” in his own words. On the other hand, he was adamant in supporting the TRAIN law that has eroded workers’ wages as inflation continues to worsen. And he has called for passage of regressive TRAIN 2 that will lower corporate taxes. Workers and the poor are suffering under PRRD. Besides endo and inflation, workers communities are ravaged by the bloody war on drugs and the wanton arrest of tambays. Which will be relentless as PRRD has insisted in SONA 2018. Human lives are protected and upheld by human rights despite PRRD’s rhetoric. The more than 12,000 most poor that have been killed in the war on drugs unequivocally reveals that human lives are lost when human rights is disparaged.